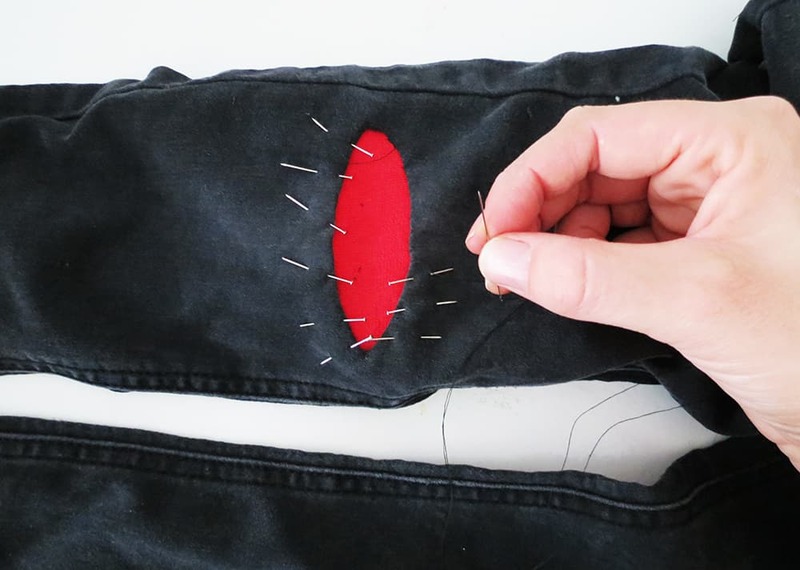 If like me you love to sew, you surly have already heard things like these: Can you please shorten my trouser edges, replace this zipper, sew this button, stitch this hole. We all agree that’s not the part of sewing we like, and that everyone can learn to mend…no seamstress talent is required! That being said I had fun patching a knee hole in my daughter pant. This is one of her favorite denim and she didn’t want to convert it into short or throw it away. As I had to spend time stitching this hole, it was better to make it fun. 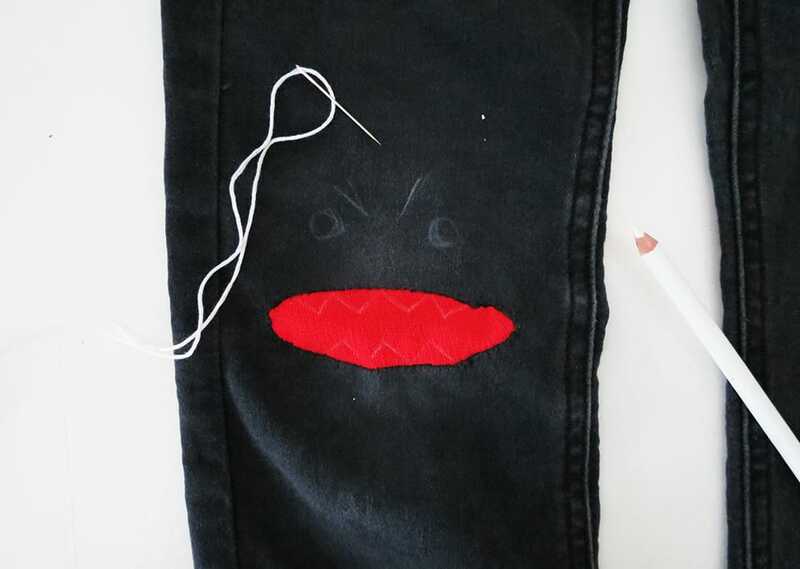 So with a piece of red fabric and some embroidery threads I created a monster face. It was the funniest mending I have ever did! 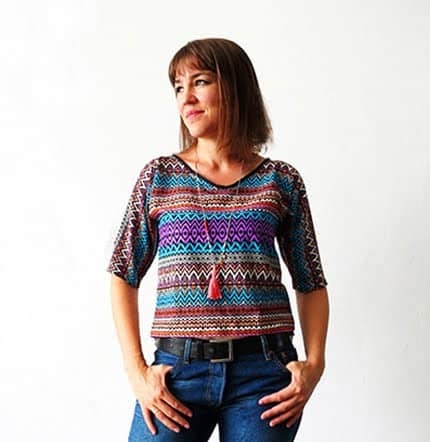 Si, como yo, te gusta coser, seguramente ya has escuchado cosas como estas: puedes acortar mi pantalon, reemplazar esta cremallera, coser este botón, arreglar este agujero. Todos estamos de acuerdo en que no es la parte de la costura que nos gusta, y que todos pueden aprender a agrlar sus prendas… ¡No se requiere ningun talento de costurera para eso! Dicho esto, me divertí pachando un agujero en los pantalones de mi hija. Este es uno de sus pantalones favoritos y ella no quería convertirlo en bermuda ni tirarlo. Como tenía que dedicar tiempo a coser este agujero, era mejor hacerlo divertido. Así que con un trozo de tela roja y unos hilos de bordado he creado una cara de monstruo. ¡Fue la reparación más divertida que he hecho! In the photo above you can see the situation before I started. I trim the outgoing threads and around the edge. En la foto de arriba puedes ver la situation antes de empezar. Recorte los hilos saliente y al rededor del borde. I folded the hole edge through inside and pin them to have a clean opening. 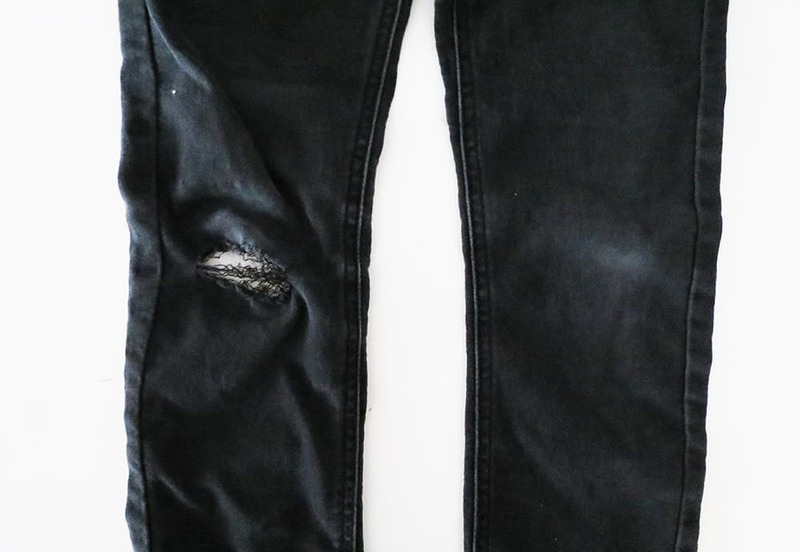 I cut a patch into an old pant. The patch must have the same kind of shape as the hole and be slightly bigger. Doblé el borde del agujero por dentro y puse alfileres para tener una apertura limpia. 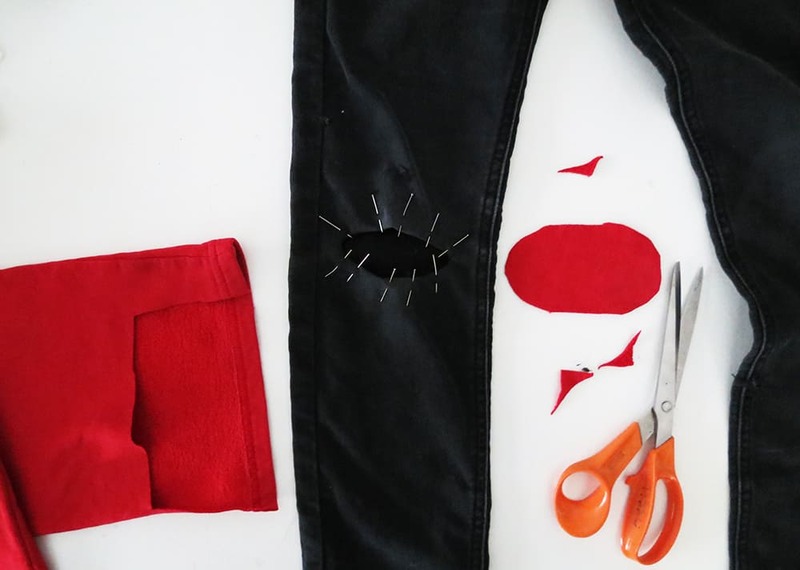 Corté un parche en un pantalón viejo. El parche debe tener el mismo tipo de forma que el agujero y ser un poco más grande. 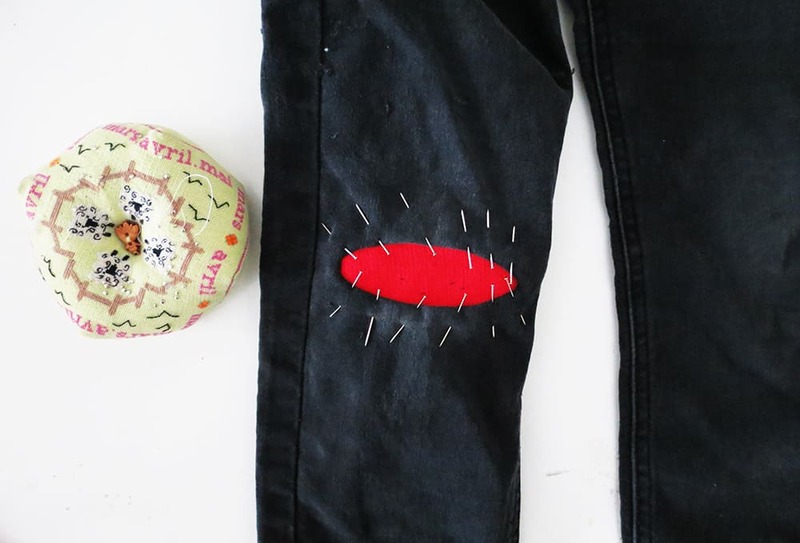 I placed the patch into the opening and pin it with the pant…watch out not to pin the back of the pants with. 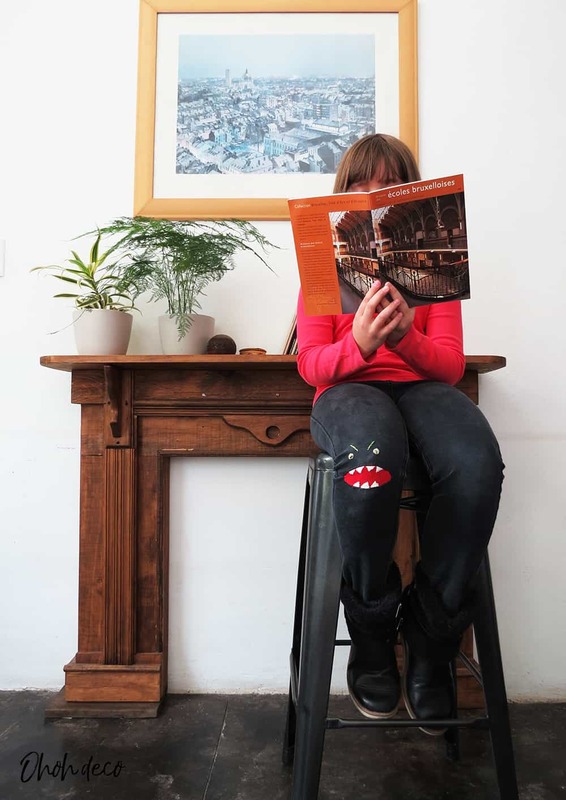 Coloqué el parche en la abertura y lo sujeté con alfileres al pantalon … tenga cuidado de no sujetar la parte posterior del pantalon. I hand stitched the patch with the pant with small invisible stitches. Cosí a mano el parche con el pantalon con pequeños puntos invisibles. With a pencil I draw the monster teeth, the eyes and the eyebrows, very simple shapes as you can see. I fill the shapes with embroidery thread, I have no experience embroidering so I just did my best to fill up the shapes. I use white thread for the teeth, beige for the eyes and green for the eyebrows and the eye center. Con un lápiz dibujo los dientes de monstruo, los ojos y las cejas,son unas formas muy sencillas como puedes ver. Rellene las formas con hilo de bordar, no tengo experiencia en bordado, así que hice lo mejor que pude para rellenar las formas. Use hilo blanco para los dientes, beige para los ojos y verde para las cejas y el centro del ojo. And done! 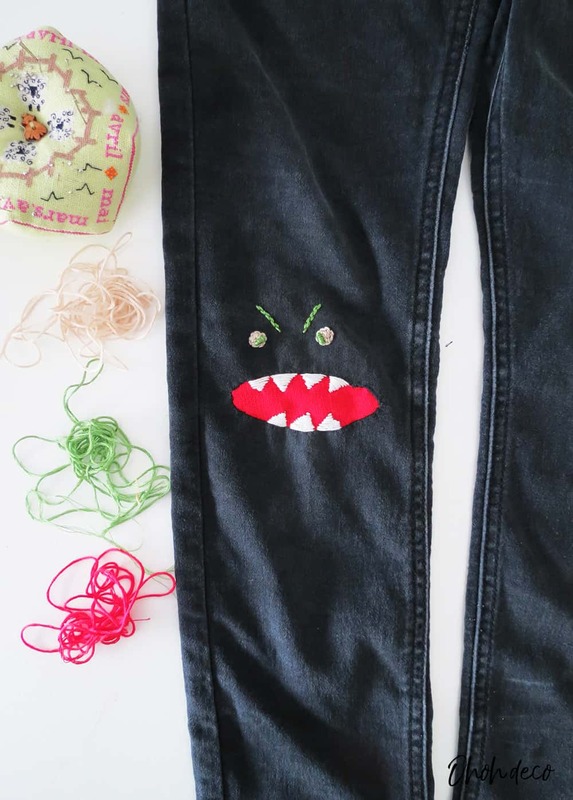 No need to throw kids pants away anymore, you can mend them with some funny monster patches! 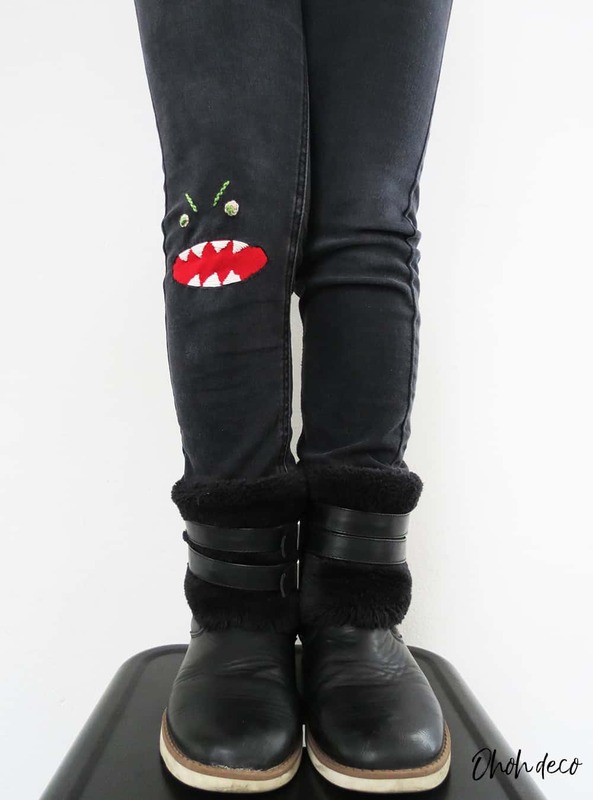 The good think is it works with any color of pant and you can make happy monster faces if you like. What do you think? ¡Y hecho! 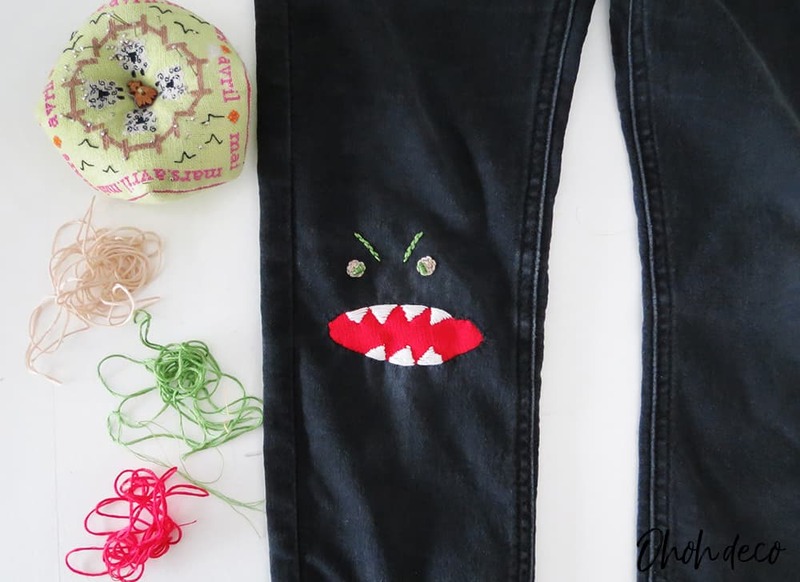 ¡Ya no es necesario desechar los pantalones de los niños, puedes arreglarlos con algunos parches divertidos de monstruos ! Lo bueno es que funciona con cualquier color de pantalón y puedes hacer un monstruo con carita feliz si quieres. Que opinas? Very cute, easy and fun. My 12 yr old even helped. I wish I understood how to post a picture. We did ‘ Grover on jeans and a flower on a shirt elbow. Thanks for great inspiration. Thank you for Sharing those Tips. Really it was very helpful for me. Thanks again. This is an amazing blog and the design is such a rock for chick. Cheers!